LightBulbs of Unusual Size: Is this ‘bright-like-the-sun’ big like a planet also a death-star? I mentioned earlier (when talking about the eye-glass power scrubber) that its getting harder to see and more light is needed. 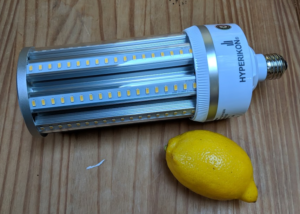 So I did what any sane person would do, I tried to find a replacement for a mercury-sodium-vapour arena lighting with an E26 base on the cheapest electronics site I could find. And here it is (full-size lemon for scale). This is not a small light bulb. At 90mm in diameter and 250mm in height, well, its not light (weight-wise) either because of all the aluminum (ium for you incorrect-spelling-folk). But, the box promises 6800 lumens @ 5000K (daylight colour), and that seems like a good amount of lumens for a background light to me. So, acquired. I then go to install it in my floor lamp. Uh, we have a couple of problems. First, its way too heavy, so the lamp bends. Its also quite a bit taller than the shade, so the insanely bright individual LED's create spots. Hmm... 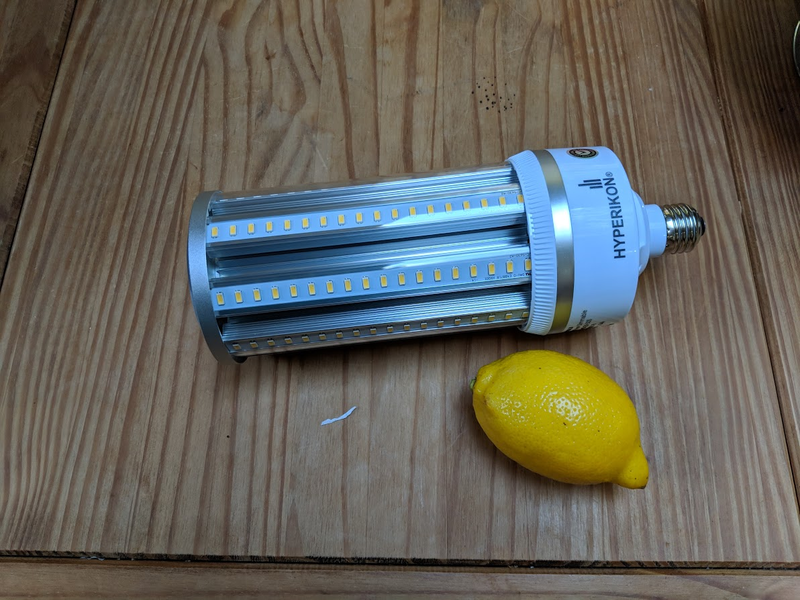 So now we need an E26-base lamp that can hold a 2kg light bulb. Perhaps I should have gone for the 'Mogul' base-bulb after all, now that I have to upgrade the lamp. I briefly considered 3D-printing some struts to reinforce the lamp, but, well, that's just stupid (and wouldn't work). 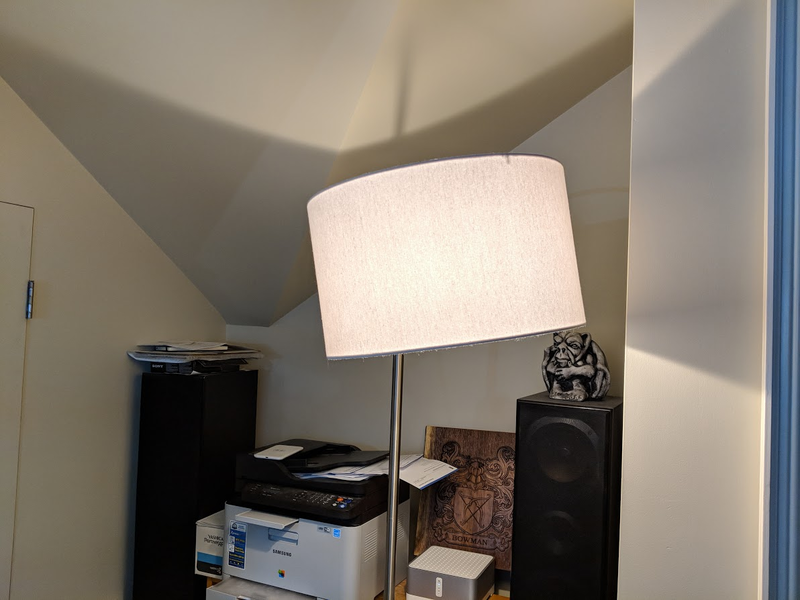 My sad floor lamp now has a bit of a speed-wobble to it after the attempt, even w/ the original '300W equivalent' LED bulb back in it, so, uh, that makes me think that having it hold 2kg of angry hot electricity wouldn't be wise. Anyone got a suggestion for a sturdy lamp with an unusually large shade to spread out the highly focused rays of a localised white giant star?